'J P Dutta's clownish treatment of history and hard-earned triumph demeans the efforts and sacrifices of real-life martyrs and bravehearts with its pompous ideas of valour, clunky writing and a cadre of lacklustre actors,' says Sukanya Verma. Director J P Dutta's distinction in grandiose sentiments, dramatic aggression and intensive star power led to many career highs as he shifted focus from Rajasthani feudalism to India's war scene. Of these, Border is certainly his most celebrated if not paramount. The same self-indulgence that drove Dutta's sophomore war drama LoC: Kargil revs his instincts in Paltan and yet again another Border it is not. While LoC still had some moments of craft and scene stealing turns from a star-studded cast, Paltan alternates between unintentionally hilarious and outright boring. Dutta rakes up India and China's history of territorial disputes with the 1967 Nathu La clash along the Sikkim border. 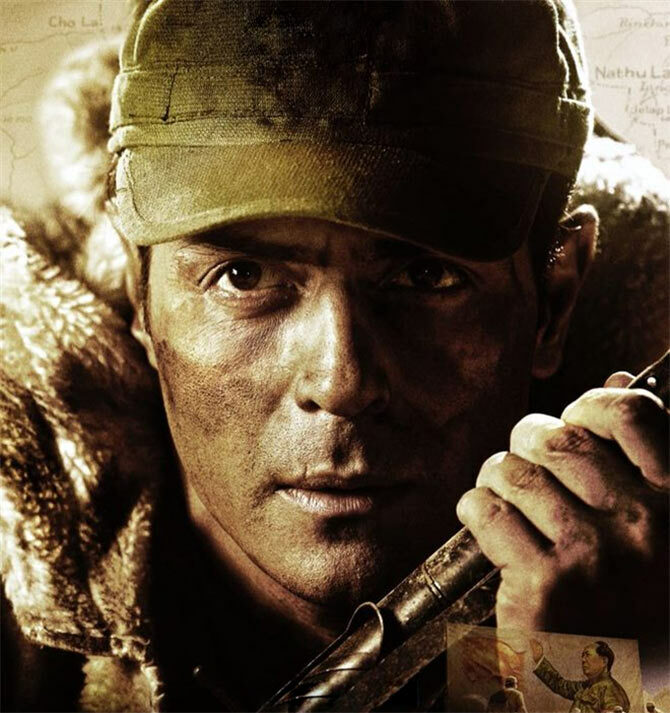 Following the Indian Army's crushing defeat at the hands of the Chinese People's Liberation Army in 1962 -- documented most memorably in Chetan Anand's Haqeeqat -- this victory was viewed as a reassuring comeback. But Dutta's clownish treatment of history and hard-earned triumph demeans the efforts and sacrifices of real-life martyrs and bravehearts with its pompous ideas of valour, clunky writing and a cadre of lacklustre actors. An already crawling narrative hindered by whiny songs, gawky flashbacks and patriotic small talk, Paltan begins with haphazard recap of 1962's events. Next, we trail a postman, sporting a Burberry print scarf, delivering the news of loss to bereaved families drowning in cries of 'shaheed' and overblown hysteria. Paltan's distaste for subtle only grows you'll soon find out. Five years later, India's armed forces look ready to put China in their place and not be deceived by their 'Hindi Chini Bhai Bhai' chants. On screen, that translates to classroom scraps for space as though it's some inter school contest between Model and Rajput. Except Indian soldiers employing kabaddi-like tactics to distract Chinese or juvenile stand offs is plain silly. The stone pelting that ensues is an excellent opportunity to underscore a jawan's chaotic, out of control frame of mind and the harsh conditions they live in owing to bad climate and loneliness. Instead, you see folks (Gurmeet Choudhary, Harshvardhan Rane) flashing their bare torso and six packs in low-waist pants broadcasting their desh bhakti as if they'd been transported thousands of metres above sea level not on the front line but an open-aired gym. In one scene, an armyman asks his fiancée (all women in Paltan are strictly of token and blink-and-miss variety) to watch Usne Kaha Tha and learn how wars are fought. Uninspired, flatly shot combat scenes coupled with a bland coverage of the rugged terrains of Ladakh add to its overall dullness. The only point Paltan really has is it is 1967 and history will not repeat itself. Besides a dial phone, there's little to convey the period in a movie that behaves like it already anticipates the outcome of its on-going conflict. At one point, Arjun Rampal even remarks, I wouldn't miss this historic moment for anything. Jackie Shroff's mumbling accent suggests something else. The actor sounds like he is swallowing his yawns. 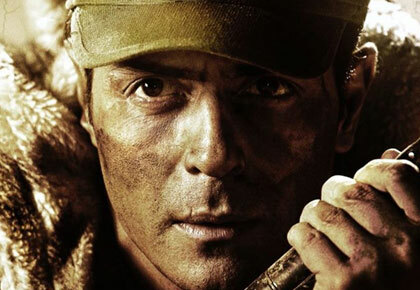 With veterans failing, it'd be too much to expect from a reliably deadpan Arjun Rampal. The latter looks like he'd rather be before a fireplace than this film. Paltan drums up heroism for narrative, drama, consequence and conversation. Rampal and Sonu Sood's characters seem to be reading out from a book of slogans -- Do or die. Their passionate war cry of Sarvada Shaktishali would feel a lot more effective if the enemy was portrayed formidably. Led by someone resembling a Chinese Jabba the Hut, they are little more than standees gawking at bombastic Indian officers prophesising, 'Humari paltan itihaas rachegi' like professional orators before a dumbstruck Chinese audience. The one off screen gets no relief either. Hindi Chini Bhai Bhai, once again.